So far this week we've offered glimpses about how innovation is pursued at a large academic medical center, and how it looks at a mid-sized for-profit hospital. Now it's time to profile a small facility, where distance from big cities only makes the need to innovate and improve that much more critical. Artesia, New Mexico has a population of nearly 12,000, but it's surrounded on all sides by empty expanses of scrubby desert. "Any big city is two to four hours away, whether it's Lubbock, Albuquerque or El Paso," said Eric Jimenez, chief information officer of 49-bed Artesia General Hospital. That hasn't stopped the small hospital from prioritizing innovation in a big way, he said. It's how Artesia, with an IT staff of just 17 people, was able to successfully attest to HIMSS Stage 6, just two years after replacing its entire EHR and PACS systems. And there's no rest for the weary. "After we met Stage 6, our next goal was to see how can we improve and get the most out of our EHR," said Jimenez. The small team is engaged throughout the hospital on that optimization mission, he said, "doing SWOT analyses of our different departments and looking for opportunities where we can streamline the process." Beyond that, Artesia has higher aims: "My goal is to hit Stage 7 by December of 2018," said Jimenez. "We already have our projects lined out to go that way." Jimenez applauded his small but scrappy IT shop – past winners of our award for Best Hospital IT Departments. "I put my team through a lot, and I appreciate what they do," he said. "In the past four years we've hit a lot of milestones. And it wasn't because of me, it was the team I had behind me that supported my innovation ideas." For example, the benefits that can come from seemingly simple EHR optimization projects – or the integration of just the right add-on app or module – can be huge for a small hospital such as Artesia General. "I'll give you cardio as the perfect example," said Jimenez. "Our EHR didn't have a way to integrate it in there, so we sat down and they had another piece of software called Epiphany that did all that stuff, so we integrated it in there, worked out the bugs, and eventually the workflow went from a couple days, this backlog of manually entering stuff in the system by scanning it, to instantly. Everything was real time. That was a real innovation." "If you don't have a happy physician because he's frustrated with the EHR that doesn't help the patient overall." The OR is another example. "Our anesthesia providers were upset that they couldn't document in real time. We went to our EHR vendor and they said, 'We don't have anything for them.' So we went out to the market and looked for a good piece of software that would mirror that,” he said. “And then we brought the anesthesia providers in and said, 'OK, here are the three vendors that we're looking at, and how could it improve your workflow.' We got them to buy into it." The strategy for innovation at a small hospital should stay focused around that human touch, said Jimenez. "You find their pain points, you show them the solution and then have them buy into that solution. You want to make them feel like they're the owner, and then work alongside them to help clear out their pain points. "We went from a fully-paper anesthesia process to a fully electronic one, where the anesthesia machines are all sending data to their system and they're actually able to do it in real time," he explained. "Before it would take them days. We just look for broken processes and try to provide them a solution – make them an owner of that solution." 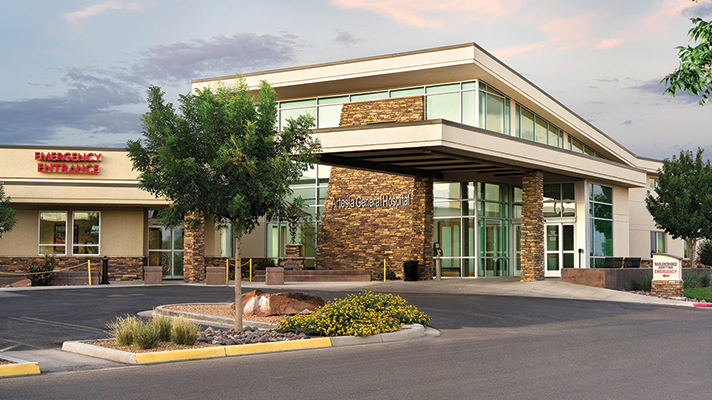 As Artesia aims for the two goals of attaining Stage 7 and meeting its numbers for the Promoting Interoperability Programs run by the Centers for Medicare and Medicaid Services, Jimenez says the small hospital is reaching out for helping hands wherever it can find them. "We're engaged with CommonWell Health Alliance, we're engaged with the state HIE, we're reaching out to a lot of other local hospitals around the area, trying to get that engagement together so we can build a community around our patients," he said. After all, "patient care and physician usability" should be the twin guiding lights for any hospital innovation initiative, regardless of how big or small it may be. "Our providers are our bread and butter, so we try to build and innovate around them – investing in technology that will improve their throughput," said Jimenez. "We're looking at virtual scribing, for instance. Because if you don't have a happy physician, because he's frustrated with the EHR, that doesn't help the patient overall."